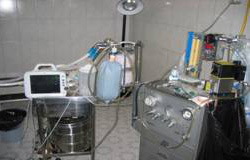 The educational programs at the Department of Anesthesiology and Pain Medicine teach trainee physicians the knowledge, skills and professionalism required for clinical excellence; promote compassionate patient care; inspire a sense of enquiry and life-long learning; and develop leaders in anesthesiology, pain medicine, and critical care for the 21st century. For detailed eligibility information, please view the Department's policy on Eligibility & Selection. The University of Washington was founded in 1861 and is located in Seattle on the shores of Lake Washington. The UW School of Medicine has an outstanding national reputation for teaching, clinical service and research. Likewise, our department is ranked among the leading academic departments in the country. 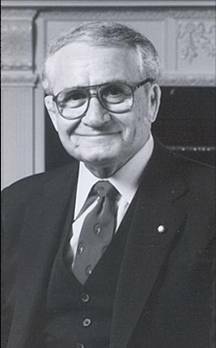 The Department of Anesthesiology & Pain Medicine was founded in 1960 by Dr. John Bonica, a world leader in regional anesthesia and pain management. We pride ourselves on the depth and breadth of the training we offer. When a physician completes our program, he or she is equipped to manage any clinical situation in the perioperative period. The University of Washington Medical Center is located on the university campus and our residents and faculty have ready access to scientists in all disciplines so that collaborative efforts are facilitated. The Department has extensive grant-supported basic and clinical research programs and many externally funded grants. In April 2011, the UW Anesthesiology & Pain Medicine Residency Training Program was reaccredited by the ACGME for a further period of 5 years following on from our previous 5 years. This achievement places our program in the top echelon of residency training programs nationally. We are accredited for 28 in each of the clinical anesthesia (CA) years 1 through 3; we offer 26 "categorical" positions for PGY1 residents who rotate through linked medicine and surgery rotations. The categorical positions (Clinical Base Year) are a popular choice as they allow residents to remain in the same program for all 4 years of their training and to take advantage of excellent training opportunities. By offering the majority of our positions as four year training we compete with the top programs nationally. 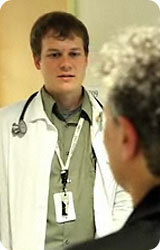 We have developed a well-balanced internship year providing outstanding experience in general internal medicine. As well as this strong grounding in medicine, our interns also experience a variety of other specialties which provide a strong base to their clinical anesthesiology training. This includes months of intensive care, pain, anesthesiology, otolaryngology, pediatrics, and emergency room care. Anesthesiology is an increasingly popular subspecialty for graduating medical students. The Department of Anesthesiology & Pain Medicine has close links to the University of Washington Medical School, offering 2 and 4 week clerkships for medical students from both the local medical school and from schools across the country. Anesthesiology is a popular choice for graduating medical students; between 7 and 11% of UW graduates enter the field and of these upwards of 50% join our own residency program. We welcome applications from external medical students to join our program for a clerkship - come and work with our residents and attendings and experience our training program first hand! - many current and former residents joined our training program after being favorably impressed as medical students. Contact Louena Goodwin lfg@uw.edu 206-543-2773 for details about our Medical Student Clerkships. Residents enrolled in our training program are enthusiastic, dedicated and hardworking physicians who have to deal with some of the toughest cases referred to our hospitals across the 5 "WWAMI" states. Consequently our graduating residents are highly sought after by private practice and academic institutions across the country. Residency training at the University of Washington is conducted at the four major affiliated hospitals, University of Washington Medical Center (UWMC), Harborview Medical Center (HMC), Seattle Children's Hospital (SCH) and Veteran’s Affairs Puget Sound Health Care System (VAPSHCS). Residents may also undertake subspecialty rotations at local private hospitals including: Virginia Mason (regional anesthesia and ambulatory surgery), Swedish Medical Center (obstetric anesthesia), Evergreen hospital (obstetric anesthesia) and Northwest hospital (cardiac anesthesia). Our training program adheres strictly to the program requirements defined by the Accreditation Council for Graduate Medical Education. 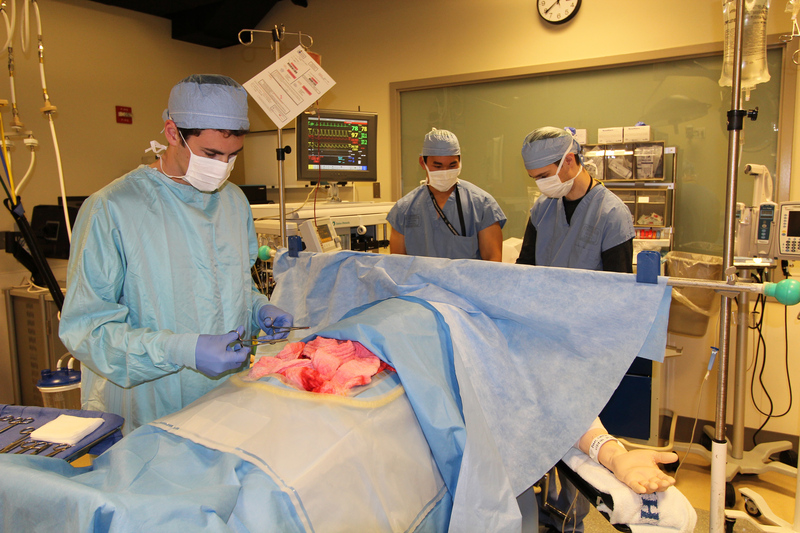 Resident training in anesthesiology and pain medicine is in many ways an apprenticeship, with an emphasis on teaching and learning "on the job" in the operating rooms, intensive care units and pain clinics. The UW anesthesiology program provides ample clinical cases and training opportunities in all areas of clinical anesthesia, pain medicine and intensive care. The teaching faculty at UW represent a diverse group of highly trained anesthesiologists. There are currently 182 faculty the majority of whom trained at the best institutions in the US and Canada. In addition the department has recruited widely internationally to add depth to both the clinical and research expertise in the department. This provides residents with a rich educational environment and exposure to many "right ways" of doing things! Faculty work closely with residents at all times providing supervision and clinical teaching in the operating rooms. In many cases residents are supervised 1:1 by faculty particularly in areas such as cardiac, obstetric and pediatric anesthesia. 2:1 supervision (2 residents with 1 attending) is provided in the first 4 weeks of a resident's training after which residents are gradually exposed to more independence as their clinical experience grows. At all times the minimum supervision residents can expect is their faculty member supervising one other operating room with a CRNA or another resident. 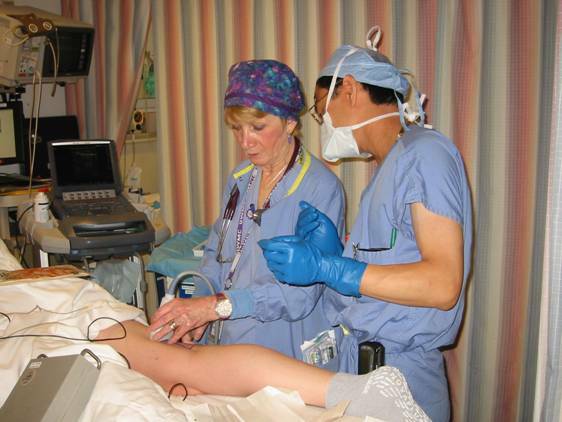 Dr. Janet Pavlin demonstrates ultrasound-guided popliteal nerve blockade to Dr. Jasper Chen. 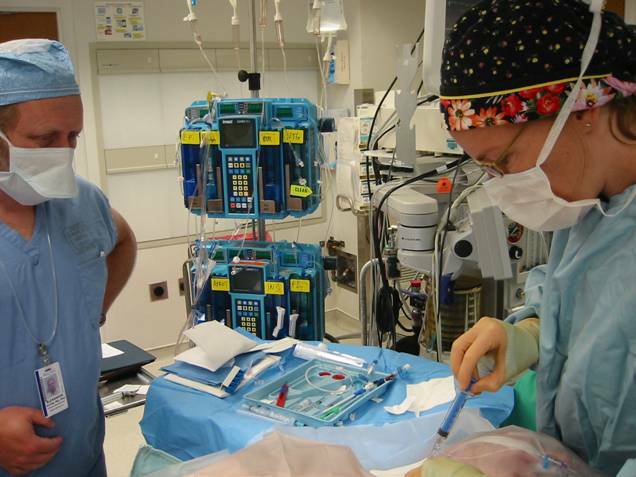 Dr. Alex Vitin assists Dr. Diane Goebel placing a swan ganz catheter in a patient for liver transplantation. With upwards of 120 OLT cases per year our residents all get ample experience of these most challenging cases. If you can handle a liver transplant you can handle just about anything! Our curriculum has undergone a major redevelopment, based on resident feedback and our desire to match our educational methods to the best evidence in adult education. In the past, residents experienced a fairly static set of lectures from faculty. We have moved away from this model, and now ask faculty to have residents prepare for their academic hours by reading appropriate preparatory materials (textbooks, journals, etc) and then conduct interactive, problem-focused sessions that explore gaps in residents’ knowledge. Our residents’ responses to this change have been very positive. In the first 2 months of the academic year, CA1 sessions cover physiology, pharmacology, anesthesia equipment, and the fundamentals of the practice of general anesthesia. For the remainder of the year, senior residents re-enter the schedule, generally following a three-weekly cycle for the CA1, CA2 and CA3 residents. CA1 residents continue with fundamental knowledge, while CA2 residents focus on subspecialty areas such as cardiothoracic, neuro and regional anesthesia. During CA3 year, the curriculum offers a number of interactive seminars with an in depth discussion of pertinent topics. Residents also experience protected education time during their subspecialty rotations in obstetric anesthesia, pediatric anesthesia, intensive care, and pain medicine. In addition, we are in the midst of a complete re-development of our simulation curriculum, increasing the frequency of simulation sessions and including more focus on hands-on skills, including TTE, TEE, vascular access, regional anesthesia, and difficult airway management. 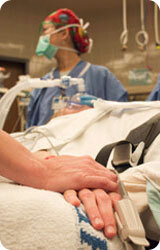 In addition, we continue to deliver complex situational simulations at our nationally recognized simulation center. To support CA1 residents as they advance towards their Basic Exam, the Department currently subscribes to the “Learnly” program of on-line learning based at Stanford university for all CA1 residents. Faculty receive the weekly list of topics so they can adapt their in-OR discussions the areas where residents are focusing their attention. Senior residents are sent a weekly evidence-based anesthesia chapter, and are encouraged to review that chapter and the primary literature to supplement their in-OR discussions. In addition to the above, the department hosts weekly resident conferences at each hospital, departmental grand rounds, morbidity and mortality conferences, journal clubs, oral boards reviews, and special evening seminars. Resident attendance is expected at all educational events and CRNAs and faculty provide coverage in the ORs to facilitate resident attendance at educational events. All full list of weekly conferences is provided. At UW we pay strict attention to the ACGME defined work hours and closely monitor our resident duty hours. In the 2016-2017 academic year, the average hours worked by residents per week were: CBY: 60.1, CA1: 58.2, CA2: 58.9, and CA3: 55.3. We have a fully operational anesthesia simulator and a well-defined program of simulation sessions for residents covering a wide curriculum of critical incident management, TEE and fiberoptic bronchcoscopy team work and communication skills. Our simulation center has recently received recognition from the American Board of Anesthesiology (ABA) as a training site for maintenance of certification for practicing anesthesiologists. Residents training in our high fidelity simulator. The simulation curriculum includes critical incident management, leadership and effective team working. There are many opportunities for residents to become involved in research projects. 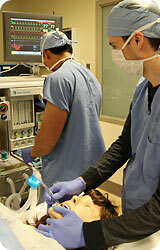 We are ranked number 2 nationally amongst other Anesthesiology departments for NIH grant funding. Our many nationally and internationally recognized faculty are actively engaged in all manner of research including laboratory based work, clinical research, and analysis of closed claims data from the Closed Claims Data base. 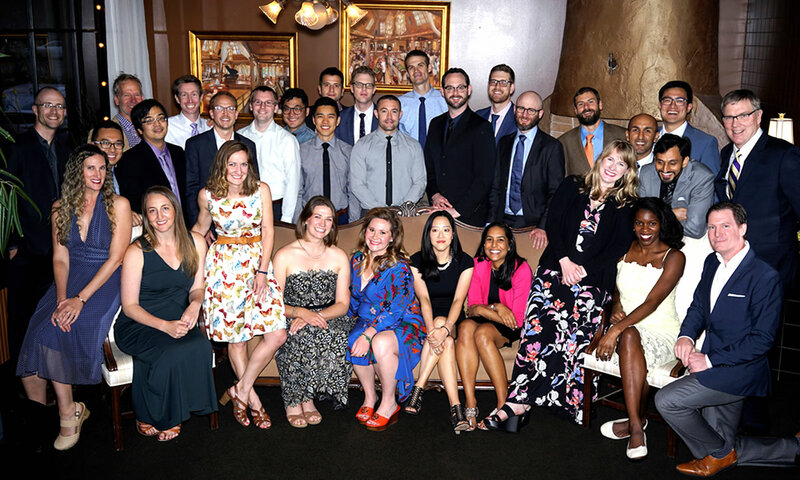 Many of our residents present abstracts and posters at local and national meetings such at the Western Anesthesia Resident Conference (WARC), ASA, IARS, SNAAC. Each resident is provided with a generous academic fund to facilitate scholarly activities and there is additional departmental funding for residents who are selected to present work at national meetings. In the CA3 year all residents have an elective month which allows an opportunity to undertake more detailed research projects. In the CA3 year residents with a definite academic interest may participate in the 6 month resident research track (RRT). This track is an alternative to clinical anesthesia devoted to developing the skills necessary for a career in academic anesthesia and research. With appropriate approval and mentoring residents work on clinical or laboratory based research projects. This innovative program offers a 5-year continuum of education beginning with the Clinical Base ("internship") year and culminating in eligibility for certification in both Anesthesiology and Critical Care Medicine through the American Board of Anesthesiology. The first three years of training parallel those of trainees in the conventional residency track, and include a total of 5 months of intensive care unit rotations. The last two years of training integrate 12 months of Advanced Critical Care Medicine at the fellow level with conventional Anesthesia rotations and electives. This blending of training over the final two years allows trainees to enhance their operative skills while mastering the field of Critical Care Medicine. Critical Care fellowship rotations are jointly administered between the UW Department of Anesthesiology and the Department of Medicine, Division of Pulmonary and Critical Care Medicine. Please see Innovative Program Curriculum Description for further details. This innovative program offers residents the opportunity to complete an extra 2 years of research after completing their clinical training. The medical students who match to this program are paired with a research mentor early in his/her training in order to facilitate research relationships early. Drs. 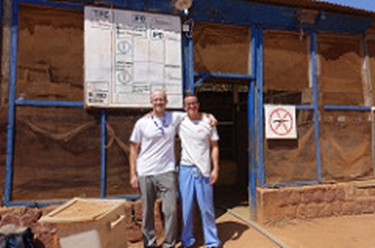 Wil Van Cleve and Matt Hotchkiss, two of our program’s recent grads on a MSF mission in South Sudan. 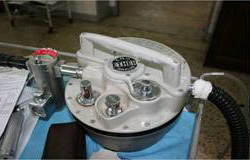 used by anesthesiology residents on overseas expeditions. for many residents wishing to travel overseas during their residency training and beyond. The Department of Anesthesiology and Pain Medicine at UW enthusiastically supports resident involvement in global health. A number of our faculty are active in international medicine in sites across the globe, and are excited to provide mentorship and opportunities for interested residents. 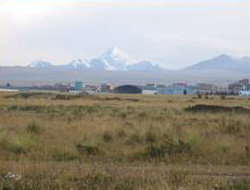 In the CA3 year, the Department funds a month-long elective during which residents may choose to devote to an international health experience. Over the past decade, our residents have been very competitive in the Society for Education in Anesthesia / Health Volunteers Overseas Traveling Health Fellowship. Residents have traveled to and contributed to ongoing education and development work in Tanzania, Malawi, Vietnam, South Africa, Nepal, Uganda, and Columbia. In recent years the increased interest in anesthesiology training from medical students and the national shortage of well-trained physician anesthesiologists has prompted our program to expand our rotations both within our own institutions and elsewhere. Our goal is always to offer a wide variety of training opportunities for our residents to prepare them for where ever their future practice and passions lie. The University of Washington Department of Anesthesiology & Pain Medicine has a long history of developing leaders in the field and providing exceptional training. Our Program Director, Dr. Matthew R. Hallman, joined the Department in 2010 after completion of an anesthesiology residency at Northwestern and critical care medicine fellowship at Stanford. He has been an ABA exam question author, has formerly served as program director for the critical care medicine fellowship, has a history of dedication to medical education, and has worked in both private practice and academia. His experience and understanding of graduate medical education provide him a valuable perspective on the changing landscape of anesthesia practice. Please call, email or write if you need additional information or assistance. Contact Louena Goodwin: 206-543-2773, fax 206-543-2958, lfg@uw.edu.